Why I like Writing Steampunk by J.K.Coi | STEAMED! First, a great big thank you for having me on STEAMED today. I am so excited to be here! I’m also very excited because it’s release week for my steampunk novella from Carina Press! 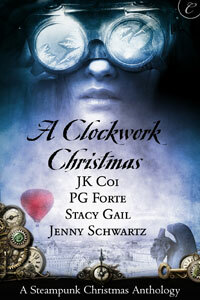 I was very lucky to be included in a wonderful holiday anthology called A CLOCKWORK CHRISTMAS. All of the four stories are very different, and yet have a common theme – even besides the steampunk elements – forgiveness (which is really quite fitting for the holiday season). 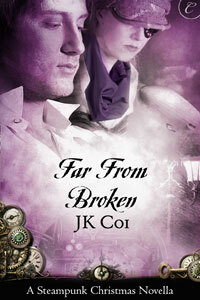 FAR FROM BROKEN is the story of a man whose secrets and lies almost destroyed the most important thing in his life—his wife. Now, he’ll do anything for her forgiveness except put her in danger again, even though he may not be able to prevent it because danger has come looking for them both. When the idea for this story hit me, I was afraid to write it. Not only did I know it would be an emotionally draining book, but the steampunk elements meant a lot of research and I usually shy away from research. But I just couldn’t let it go, and ended up writing it anyway. I learned quickly that writing steampunk isn’t about gears and gadgets and corsets, or ray guns, airships and steam trains (although the story has all of that and more). Steampunk is something that permeates through the entire story. It’s a feeling, a mood. It not only infuses props and setting and characters, but also theme and motivation. One of the reasons why I loved writing FAR FROM BROKEN once I got into it is because I was learning so much with each and every word. I couldn’t get enough of that world, which seemed so ripe with possibility, energy and such depth of emotion. And I realized that’s exactly what steampunk is all about. That spirit of invention like the smell of burning coal churning on the breeze. The taste of potential and opportunity as a coppery tang. The feel of elegance like soft, rich velvet. Which is why I had to write a sequel. BROKEN PROMISES is a continuation of the story that began in book 1, but it also introduces a very interesting new character who is still talking to me, wondering when he’ll get a chance at center stage… which means I might just be visiting this wonderful world of steampunk again soon. Changed forever after tragedy, a woman must draw strength from her husband’s love. A man learns that love isn’t always what you expect. A thief steals the heart of a vengeful professor. And an American inventor finds love Down Under. Enjoy Victorian Christmas with a clockwork twist in these four steampunk novellas. Great article. I totally agree that there are two levels to steampunk. First the tech and gadgetry, but second, operating on a far more emotional level is the mood. It’s gritty but somehow romantic, dark and smoky but optimistic. I think it summarizes man’s evolutionary path. For me, it also meshes well with other genres I like, especially urban fantasy and “pulp” adventure.